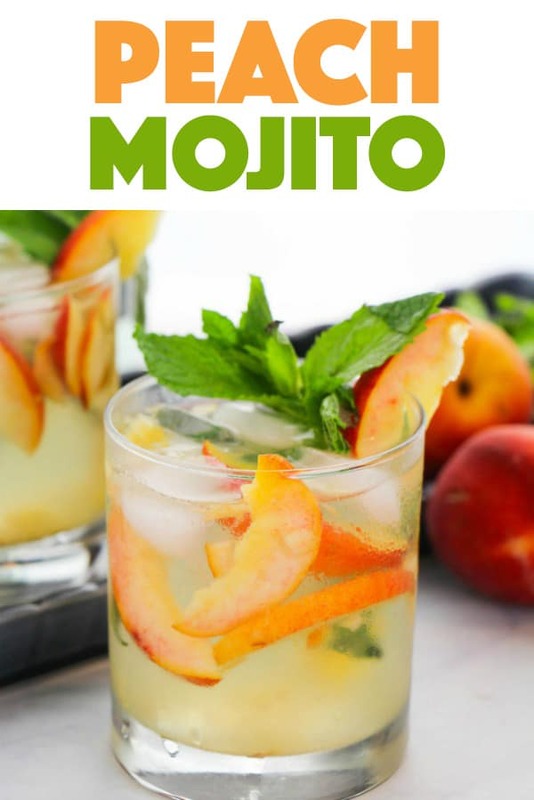 A delicious and fruity mojito recipe, this Peach Mojito is a fun twist on a classic rum cocktail – perfect for summer or backyard parties! Mojitos are a minty rum cocktail that originated in Cuba. 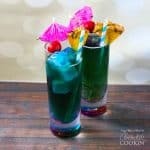 They traditionally just have rum, sugar, lime, and mint – and are topped off with a splash of club soda or seltzer, as desired. 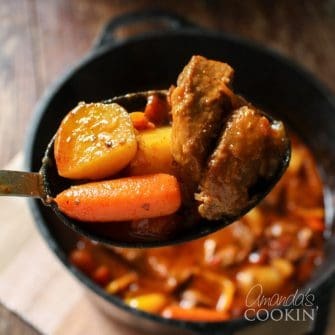 While the original version is delicious, this is one tradition you’ll be glad you broke! 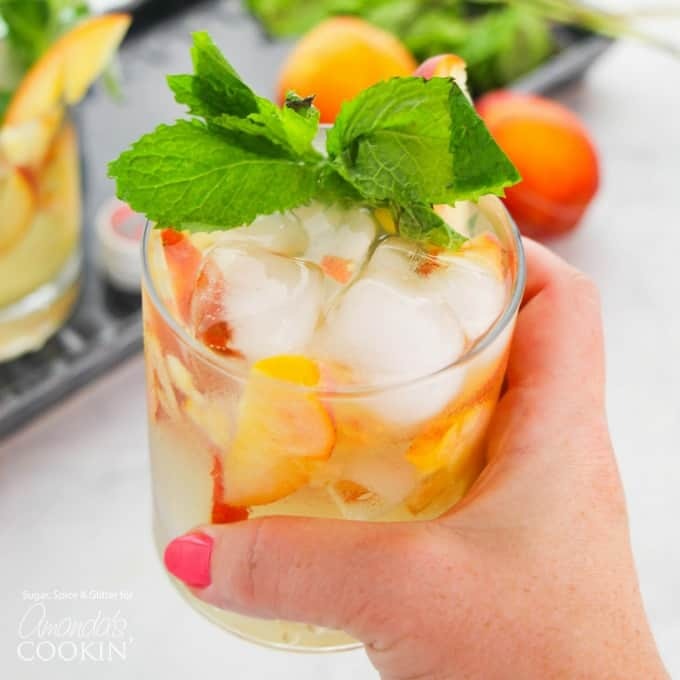 The peach and mint in this rum cocktail recipe work together beautifully, creating a crisp, clean summer drink that is undeniably refreshing. 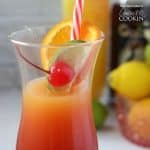 You can also add in a twist of lime for a zesty zing, but it’s not necessary. 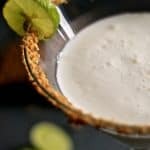 You can use simple syrup in place of the sugar, and there are even mint simple syrups developed especially for mojitos. 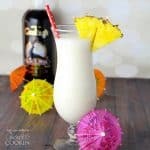 Just use half the amount of simple syrup as the sugar called for in this recipe – so for two cocktails, instead of 2 teaspoons of sugar, use 1 teaspoon of simple syrup. Simple syrup is just a boiled down water-sugar mixture and you can easily make it yourself – find our directions for DIY Simple Syrup here. 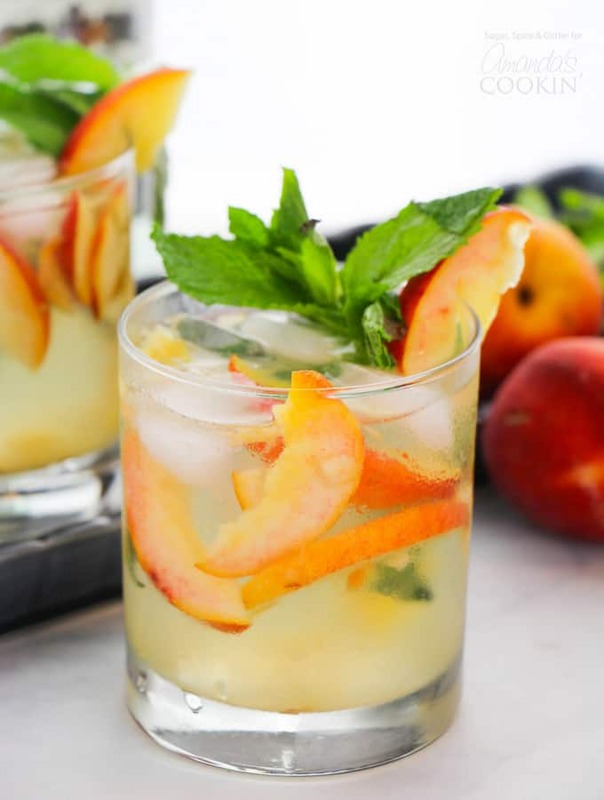 Also, you can use frozen or fresh peaches to make this peach mojito recipe. 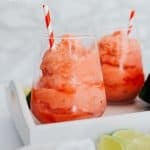 I used fresh because they make prettier garnishes – but for frozen, you just need 1/2 cup to make the base recipe, since you likely won’t be using them as garnishes. 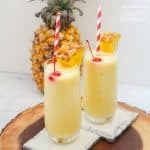 If you’re looking for more recipes to use up your supply of peaches, check out our Honey Peach Chicken Kebabs or our Peach Pie Smoothie Bowl recipe. 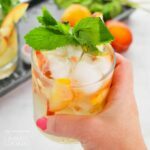 Do you have a special summer event coming up that these refreshing Peach Mojitos would be perfect for? 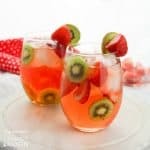 We LOVE a nice refreshing summer cocktail! Check out some of our favorites below for more inspiration. 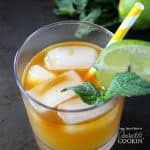 A delicious and fruity mojito recipe, this Peach Mojito is a fun twist on a classic rum cocktail - perfect for summer or backyard parties! Slice two of the peaches for garnish and chop the remaining two peaches. 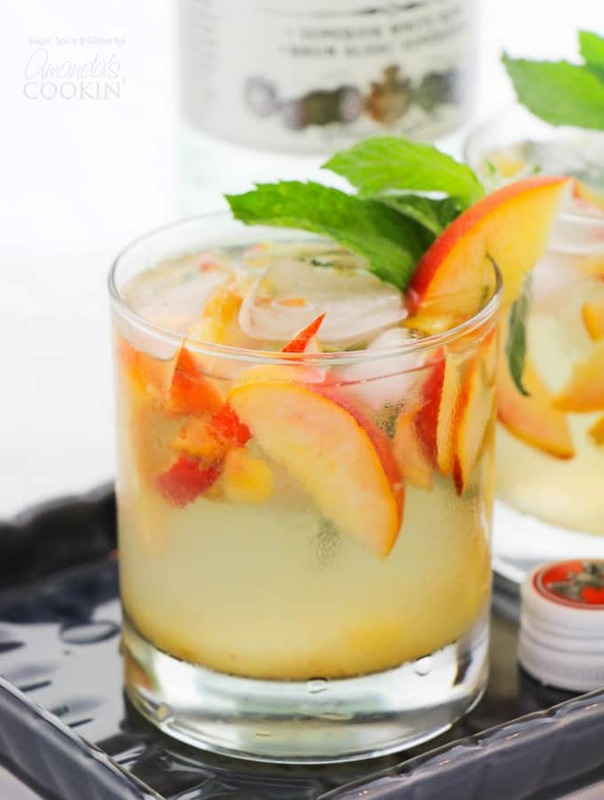 Place the chopped peaches in a muddler or cocktail shaker and add the sugar and rum. Muddle the peach, sugar and rum together until well combined and the sugar has dissolved. You can strain or just pour the peach-infused rum evenly into your two serving glasses. 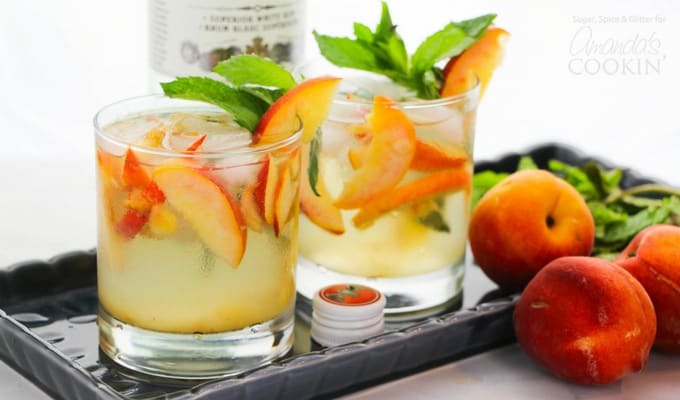 Fill the glasses with ice and garnish with additional peaches. Add a splash of club soda, as desired.